The Barefoot Contessa's Food Network fairy tale certainly didn't happen overnight. Ina Garten absolutely loves to cook — so the Food Network star’s biggest insecurity may surprise even the most devoted of "Barefoot Contessa" fans. Garten brought the former TODAY Show anchor inside her beautiful East Hampton, New York, home for the latest episode of Couric’s series “Getting There” with theSkimm, in which Garten shared unexpected details about her unique road to success. Beyond being a self-professed “bundle of insecurity” in the kitchen, the “Barefoot Contessa” cookbook author revealed that she actually wasn’t allowed to cook growing up. In fact, until she was 30, Garten never dreamed of having a job in the culinary arts — or much of a career at all. “I’m kind of of the generation of women that didn’t grow up expecting to do something with their lives,” Garten, 70, told Couric, 61. It wasn’t until her husband Jeffrey, a Vietnam War veteran who is now a dean at Yale’s School of Management, inspired Garten to get out of the house that she discovered her potential. Garten joined her husband in the political world and worked in the White House throughout the Nixon and Carter Administrations in nuclear energy policy. Despite the excitement of life in the nation's capital, Garten eventually grew dispassionate about her role. One day, while siting in her D.C. office almost 40 years ago, Garten spotted an advertisement in the paper. A specialty foods store was for sale in the Hamptons — a place Garten had never been. Instead of "standing on the edge of the pond," as Garten likes to say of people who are worried about chasing their dreams, she jumped in and seized the opportunity, buying the quaint shop called Barefoot Contessa in Westhampton (she later relocated the store to East Hampton). “I remember after the first week in I said to Jeffrey, ‘This is the stupidest thing I’ve ever done. I will never, ever figure out how to run this business,’” Garten told Couric candidly. Twenty years later, the successful businesswoman sold the Barefoot Contessa shop because it no longer challenged her. While figuring out what path to pursue next, Garten wrote her first cookbook. Now, 11 cookbooks later, it’s clear that the former policy advisor has found her true passion. 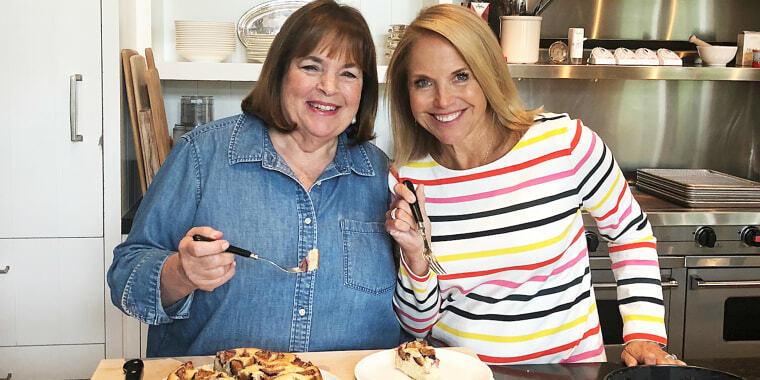 Between baking Garten’s famous fig and ricotta cake, one of the cook’s all-time favorite recipes, and touring the Food Network star’s home, Couric covered the many highs and lows of Garten’s career. The cookbook author and popular TV personality even shared her No. 1 piece of advice for young women entering the workforce. “Getting there,” a digital series that details how successful women made it to the top of their chosen careers, appears on theSkimm’s Facebook channel. Since the show's Aug. 27 premiere, Couric has interviewed businesswomen like Bethenny Frankel, actress Issa Rae and celebrity jewelry designer Jennifer Fisher.